The last Saturday we had one of the biggest open source event of the world, Flisol that is the acronym for Festival Latinoamericano de Instalación de Software Libre. The Flisol 2014 event was celebrated at Tecnological University of Panama. There where a lot of young people that joined the event to paricipate of the differents activities, presentations and workshops. In the event several talks took place about security, open source community including others. 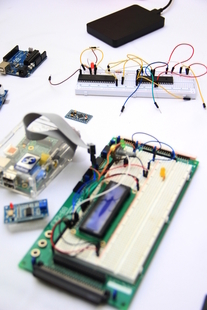 Furthermore, in parallel with workshops about arduino-java, python, ruby, among others. In recent years it’s been introduced the integration of software and hardware and in this years it wouldn’t be the exception. Antony, blogger from panamahitek.com gave a pretty good workshop about Arduino and Java where showed some projects as the serial communication library with arduino. I was charged with the open hardware stuffs and I participated as a Fedora Ambassadors and packager speaker sharing my experience and knowloged about Fedora Electronic Lab in previously electronic projects. Happily I met guys from my own Electronic’s Faculty and other professional people with some interest about the diversity of tool available on FEL regarding analogic and digital circuit design. I talked about Icaro Project and I showed the news breakout boards completely built from the actual prototype. I received comments ideas from developers that are really interested in doing electronics projects about drones, car lecture system, electronic arms, among others. I hope that at least this year we could finish one of them. The Fedora Community was very active in the event ambassadors and packagers amongs others helped to install Fedora to all the attendees that came to the Fedora booth and with it gain more knowledge about our distribution. Last but not least, thanks to the sponsors of the event, attendees, and to everyone who dedicated their part of the morning and afternoon time to share experiences about open source. Clic of the link below to get access to the photo gallery by Mónica Mora.